St. Euphrasia was born in 380 in Constantinople. She was the only daughter, and her father was a nobleman and relative of the court of Emperor Theodosius I. When her father died, his widow and daughter left and moved to Egypt, to a monastery. This was less than a century since St. Anthony had established the first monastery, but monasticism in those 100 years had spread quickly. Little Euphrasia at the age of seven, begged to take vows to become a nun at that monastery. Her mother presented the child to the Abbess, and Euphrasia took up an image of Christ and kissed it, saying, “By vow I consecrate myself to Christ”. Her mother also added, “Lord Jesus Christ, receive this child under your special protection. You alone does she love and seek, to you does she recommend herself”. Soon after, Euphrasia’s mother became sick and died. Hearing of her mother’s death, the Emperor Theodosius I, sent for Euphrasia. He had promised her in marriage to a young Senator, but she responded with a letter to the Emperor declining the offer to marry, instead she requested that her estate be sold and divided among the poor, and that her slaves be set free. The emperor did as she requested shortly before his death in 395. She was known for her humility, meekness and charity. Her Abbess often advised her to perform manual labor when she was burdened with temptations. 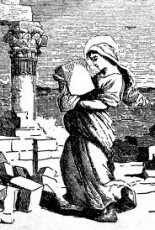 As a part of these labors, she often carried heavy stones from one place to another, and then put them back again. She did this for thirty days at a time, as a form of manual labor. Euphrasia died in the year 410, at the age of thirty. She was said to perform miracles before and after her death. She was said to have healed a deaf, dumb and crippled child and delivered a woman from possession by the devil. Before she died, the Abbess of Euphrasia’s monastery reported having had a vision of Euphrasia being transported to God’s throne, surrounded by angels. After her death, she was venerated as a saint. Her feast day is March 13th. St. Euphrasia of Constantinople was born in 380. She and her mother left their nobility after the loss of her father when she was three and joined a monastery in Egypt. Euphrasia asked to become a Nun at the age of seven and made simple vows consecrating herself to God. Soon after this her mother died, and the Emperor asked her to come back to marry a Senator. She refused and asked that her estate be divided up among the poor. She was attributed with many miracles both in life and after death. She died at the age of thirty. She is venerated as a saint for her piety and example of charity.